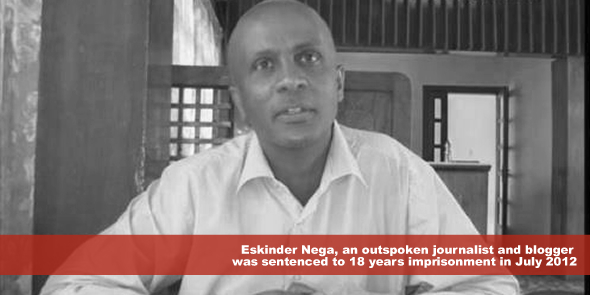 I don’t know where you get your facts but if i were you I would research more on who Eskinder Nega truly is before I proclaim him as an individual with dignity and one who should be associated with freedom of expression and free speech. Read the News Paper Asquale which he used to be editor in chief. I am sad that the government didn’t arrest him for inciting genocide. I am so tired of western journalist thinking he is the face of freedom of expression in Ethiopia. He is not and he is an idiot who should rot in jail. Seble, by such reply , it shows you are anti-democratic and taken by the tribal thinking that meles has put in place for which you and your alike are naively boasting about! Meles was a criminal, a dictator in power for 21 years, who has implemented a racial governing body with TPLF (probably your ethnic group, if not you are one of the few eating the cake with them) …if you raise your voice to send your critics about Eskender a simple journalist, why are you so silent and blinded by meles atrocities? As an Ethiopian (which I doubt you are) you should advocate the voice of the millions terrorized by this bloody regime , in which one ethnic group , tigre is dominated, this is why all Ethiopians call it an Apartheid regime and what Eskender said is absolute truth and you all deserve to be punished for having destroying our nation, stealing it having a high level corrupted government in which HR are daily abused. You are what we call in our jargon , a blinded hater of those who stand for truth and the freedom of 90 millions Ethiopians. TPLF CANCER OF ETHIOPIA , Eskender is absolute right and we shall fight you till the end! ETHIOPIA SUGGEST THAT YOU ARE A NON-LIVING. @Seble, If I may ask, what lesson have you learned from the fall of Derg, Mubarek’s, Gadaffi, Ben Ali, Hassan? ?… if not that – genocide, dictatorship, marginalizing other ethnic groups, stifling freedom of expression, terrorizing your own people, thuggery, corruption, monopoly on media, telecom and banking, nepotism…. DOES NOT WORK!!!…. The good news for Ethiopians is that if you (and your masters) are scared of a SINGLE individual (Eskinder), it would NOT be hard to throw you all in a trash bag much easy (a dictators-trash bag – like we did to Derg)!! … A wise man once said, “Those who fail to learn from history are doomed to repeat it” …… Speaking of “inciting genocide”, we’ll make sure you and every terrorist-member of this dictatorial regime will face our might of justice (INDEPENDENT justice) for genocide you committed in Ogaden region (that’s a REAL Genocide committed by thug-regime, not “inciting genocide”)…. Maybe now, my message might bring you back to reality! at Seble : can you tell us who did these genocides of gambellas? ?